In Canada, 1 in 5 families is impacted by diaper need (the inability to provide enough clean diapers for their baby) because they are struggling financially. ONE DIAPER CANADA is committed to helping families in need by providing complete cloth diaper kits free of charge. Each of these kits costs the charity $100 to assemble, this includes: diaper repairs, sanitization, a cloth diapering information booklet, packaging and shipping. One Diaper Canada + Irina Fortey Photography have joined forces to help more families receive cloth diaper kits in the coming 2018 year. We are co-hosting this fundraising event to provide donating families with a photography experience to keep alive the memory of their generosity. A minimum donation of $100 will allow you to receive a free photography session and 5x7 gift portrait. Donating families will receive a time slot to create a family portrait on October 21st between 9am – 1pm at Irina Fortey Photography’s Gallery located in Ottawa. 100% of the proceeds will go towards One Diaper Canada. Tax receipts for the full donation amount will be provided to all donors. 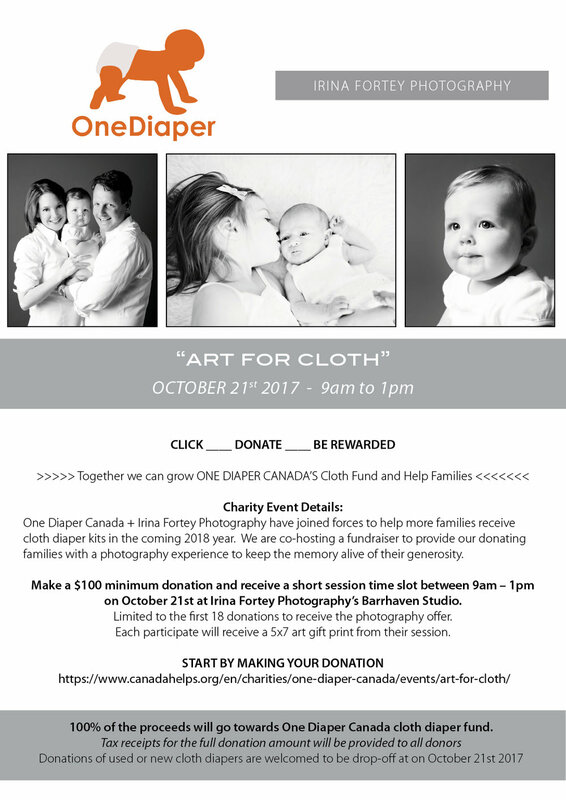 One Diaper Canada will also be accepting donations of used or new cloth diapers for drop-off at the studio on the day of your photo shoot. If you are unable to attend, please consider making a donation to help, I will offer a $50 off photography voucher for any future session with your donation.